Ever since I heard that the new Windows OS is coming out, I got excited. I love installing and playing with new operating systems, and I knew I’d love doing the same with this. It was first rumoured to be called ‘Threshold’, a working name for what would probably be released as Windows 9, but it surprised everyone when Microsoft announced it this week as Windows 10. I don’t care what it’s called, I just want to play. And I decided that I’ll write about it at the same time. Now, there’s already a million screenshots out there of Windows 10 and what it looks like, so I’m not going to do any screenshots in this article. I’m simply going to talk about my experience with installing and using Windows 10. I’m downloading the 64-bit version. You can find the downloads here. They’re ISO files, so you’ll need to burn them to DVD or USB when you’ve finished downloading your chosen version. I use the Windows 7 USB DVD Download Tool to turn ISO files into bootable USB drives. I have a USB drive with my current Windows 8.1 on it (which is on standby right now, just in case the Windows 10 install stuffs up), and I’ll be putting Windows 10 onto another USB drive. I’ll be installing Windows 10 onto my home PC as well as my laptop – both my primary devices – against all recommendations. It’s not recommended because this is a technical preview and is likely to have many bugs or issues, some of them quite possibly being quite significant. You could lose EVERYTHING! Make sure you back everything up that you want backed up, before you install Win10. You don’t want to remember about how you should have backed up your important documents AFTER you’ve reformatted your hard drive and halfway through the installation…. I’ve done that before. Once, about a decade ago. It taught me a valuable lesson about backing things up. You don’t need to learn it the hard way yourself though. The download has completed, now I’ll create the bootable USB, install it and start using it. Well, the installation was very smooth and very fast. I had a small hiccup with the USB drive – it didn’t want to work on the PC, but it worked fine on the laptop. I installed and setup on the laptop first and had a bit of fun with that, because it was probably 2-3 times faster than Windows 7 or 8 took to install. After it installed on the laptop I tried to get it to work on the PC, but no matter what I did with the BIOS configuration, it didn’t want to work. Eventually I just gave up and installed it from the ISO file directly on the PC itself. (Windows 8 allows you to mount an ISO as if it’s a separate drive, and run the setup file.) It worked well enough, and I was able to do a new Win10 installation over the old one. Note: it backed up the old Windows into a windows.old folder but I deleted it. Maybe you’d like to keep it. As I’m writing this section of this post, I’ve been using Win10 for about 5 days now. And I’ve encountered only ONE BUG. That’s pretty impressive considering I’ve installed and used Office 2013, various other applications, and even an online computer game (Eve Online – in case any of you play that too, say hi). The only bug I’ve experienced so far was when I used the built-in Search feature to find the Control Panel. Now, upon completing the search, the Search window stayed superimposed over the other application I was using, despite having found and opened what I was looking for. Attempts to get rid of it didn’t work, including closing all applications and locking/unlocking the screen. Before I logged out and back in I decided to do another Search and then pressed Escape to close the search window – that worked. That was on day 2. I’ve not had the same problem since. 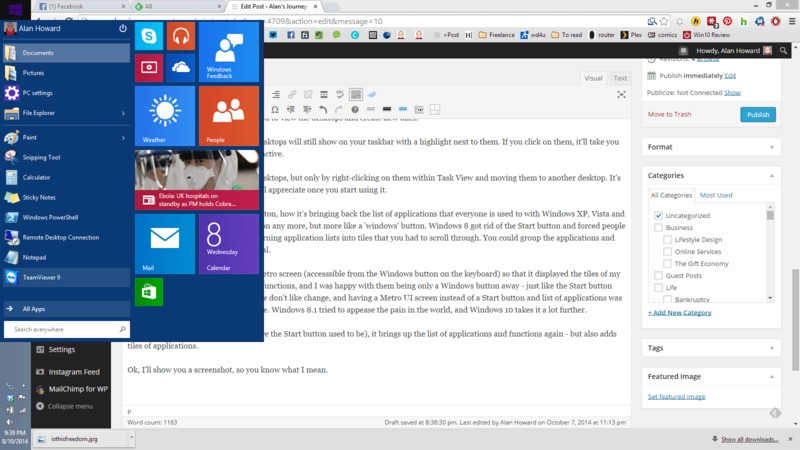 My favourite feature of the new Windows has to be the virtual desktop, which is (was?) called Spaces on the Apple OS. They’ve had it for quite a few years now, so it’s nice that Microsoft finally caught up. The advantage of Spaces… oops, sorry… I mean the advantage of the virtual desktops is that you can create new desktops and assign applications to them, and then you can scroll through these desktops using CTRL+Windows key+arrow key to get to the application you want. You get used to this after a while. It’s tidier to do this than to have all your open applications on the same screen. There’s a Task View shortcut on your taskbar that allows you to view the desktops and create new ones. 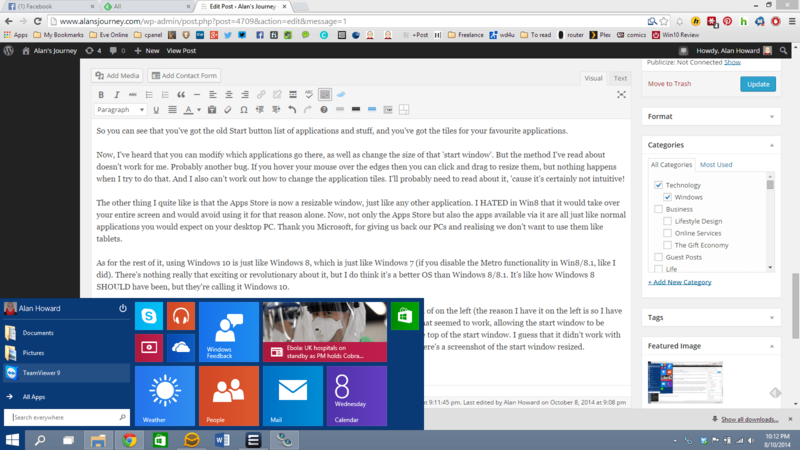 Applications that are active in other desktops will still show on your taskbar with a highlight next to them. If you click on them, it’ll take you straight to that desktop where they’re active. You can move applications between desktops, but only by right-clicking on them within Task View and moving them to another desktop. It’s a nice productivity feature, which you’ll appreciate once you start using it. Everyone’s talking about the ‘Start’ button, how it’s bringing back the list of applications that everyone is used to with Windows XP, Vista and Windows 7. It’s not really a ‘start’ button any more, but more like a ‘windows’ button. Windows 8 got rid of the Start button and forced people to use the accursed Metro interface, turning application lists into tiles that you had to scroll through. You could group the applications and adjust the tile sizes, but big freakin’ deal. I never did mind it. I configured my Metro screen (accesssible from the Windows button on the keyboard) so that it displayed the tiles of my most used applications and computer functions, and I was happy with them being only a Windows button away – just like the Start button used to be. But I know that most people don’t like change, and having a Metro UI screen instead of a Start button and list of applications was driving a lot of people absolutely insane. Windows 8.1 tried to appease the pain in the world, and Windows 10 takes it a lot further. By clicking on the Windows icon (where the Start button used to be), it brings up the list of applications and functions again – but also adds tiles of applications. Ok, I’ll show you a screenshot, so you know what I mean. Click on it to open a larger view. So you can see that you’ve got the old Start button list of applications and stuff, and you’ve got the tiles for your favourite applications. Now, I’ve heard that you can modify which applications go there, as well as change the size of that ‘start window’. But the method I’ve read about doesn’t work for me. Probably another bug. If you hover your mouse over the edges then you can click and drag to resize them, but nothing happens when I try to do that. And I also can’t work out how to change the application tiles. I’ll probably need to read about it, ’cause it’s certainly not intuitive! The other thing I quite like is that the Apps Store is now a resizable window, just like any other application. I HATED in Win8 that it would take over your entire screen and would avoid using it for that reason alone. Now, not only the Apps Store but also the apps available via it are all just like normal applications you would expect on your desktop PC. Thank you Microsoft, for giving us back our PCs and realising we don’t want to use them like tablets. As for the rest of it, using Windows 10 is just like Windows 8, which is just like Windows 7 (if you disable the Metro functionality in Win8/8.1, like I did). There’s nothing really that exciting or revolutionary about it, but I do think it’s a better OS than Windows 8/8.1. It’s like how Windows 8 SHOULD have been, but they’re calling it Windows 10. UPDATE: a friend of mine read this post and suggested I put the taskbar on the bottom instead of on the left (the reason I have it on the left is so I have more top/bottom space for content, which is restricted if the taskbar stays on the bottom). That seemed to work, allowing the start window to be resized. But it seems that it can only be resized up/down and not left/right, and only from the top of the start window. I guess that it didn’t work with the taskbar on the left because the top of the window was too close to the top of the screen. Here’s a screenshot of the start window resized. You too can enjoy the joys of Windows 10. And it’s free too! At least until mid 2015, when they’re planning on releasing the retail version. If you’re using Windows 10 as well, please share your thoughts on it below, and maybe even some issues you’re having with it.